In January 2005 I found myself in hospital quite unexpectedly. Once I was out and recuperating I looked around for something to keep me occupied that wouldn’t take too long to complete and that I could work on at a fairly slow pace. I had been eyeing up the Redoubt Enterprises Boxers for use as general Chinese thugs and gang muscle for possible pulp games. I’m a big fan of Shaw Brothers films and liked the idea of having a bunch of brightly painted Chinese hanging around. 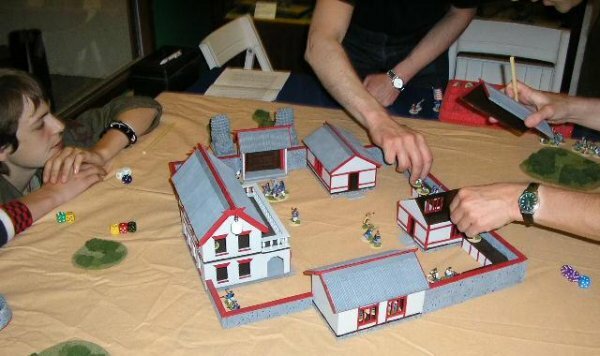 I used to have a small French Foreign Legion game that I ran at my shop, the rules were simple and the game didn’t require a lot of figures to do. It revolved around a besieged set of French holding off a never ending horde of Bedouin. I realised that this was a perfect Boxer Rebellion set up too. It didn’t take long to draw up a basic force list and order the figures. I decided on a random number of Boxers, sixty, based on the figures I wanted and the pack sizes they came in. Twenty of them would need guns; the other forty would be melee troops only. For the defenders I needed groups of six plus an officer. I ordered a set of each Nationality that was available in the range. I gave the British an extra man so they’d have better firepower (and because there was an extra figure in the range). I needed one machine gun but bought both an American one and a British one for the sake of completeness. Quite an easy task to paint that lot, I could alternate between Chinese and Colonials for variety and, no matter how difficult or boring any of the uniforms were, I only had to do a tiny number of each and never have to go back to them again. No big armies to struggle through here. An added bonus was that I’d never painted any of the forces before so I’d have fun doing some research too. Before the figures arrived I set to work making the compound. 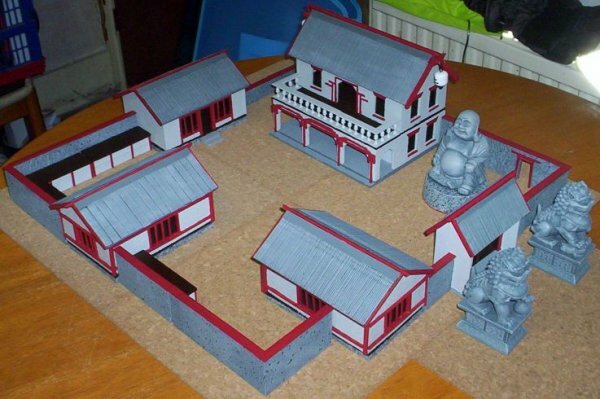 I’d made some buildings for my WWII Crossfire games out of cork board and I’d found it incredibly easy to work with so I dug out the pieces I had left over and started building. The Colonial Mission House was built by the end of the first day and my project was well and truly off the ground. The other three buildings and the wall followed in a matter of days. A quick trip to E-bay furnished the fu Dogs for the final touch and everything was ready before the figures turned up. While I was building I started sending updates to a few friends to let them know what I was up to. I started a gallery at Displaced Miniatures at the same time and started getting encouraging feedback from people I didn’t even know. This was a great help to me, especially in my weakened state. 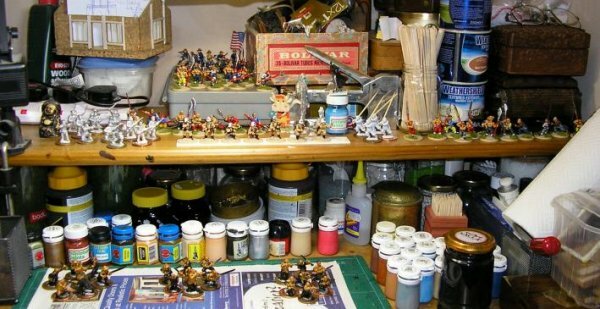 It was from this small beginning that this website and my hobby resurgence grew. 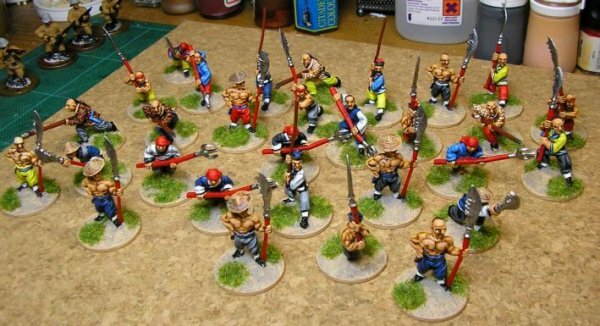 The next job was to paint the figures. I posted regular updates on the Colonial Wars Yahoo Group and the members there were very supportive too. The paintng went smoothly, I managed to paint the US marines in a day despite not really having my sight back properly. (I still don't sadly but it's better than it was then.) I was managing twenty Boxers a week and a group of Colonials in between which usually took about three to four days if I recall. Everything was finished in seven weeks. The last thing to do was to write up the French Foreign Legion rules from my twelve years old scrawled notes and have a game. It went well and the players had fun (they said). Later in the year I took the game to the Redoubt Show in Eastbourne where a few other people had a go and seemed to enjoy it too. Some even asked to play again.